Kohl's department store has a community giving and volunteer program called Kohl's Cares. One way they work to benefit kids' health and education is by selling kid-friendly merchandise at $5 per item. 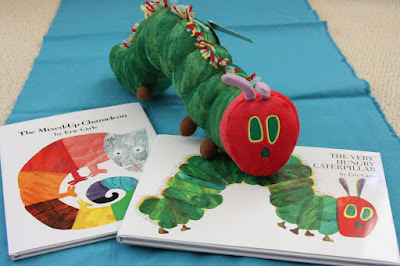 Right now they are featuring the books of Eric Carle, another huge children's author/illustrator inspiration of mine. The stuffies that go with them are absolutely adorable! Besides this Very Hungry Caterpillar you can also get the Grouchy Ladybug, the Mixed-Up Chameleon, and the Foolish Tortoise. Thanks Kohl's and Eric Carle for doing the good work! Currently reading The Art of Eric Carle. His childhood stories about growing up in the U.S. and Germany pre- and post-WWII are fascinating.